After spending a few days in Kathmandu, we caught a series of flights over 35 hours that got us all the way back home to Denver. Even under the special circumstances, we were able to do like we did for most of the flights on the rest of our trip and book it using airline miles. As we alluded to in a previous post, we had already booked a ticket leaving Nepal using miles. We were scheduled to fly from Kathmandu to Seoul, South Korea on May 12, which we purchased using United frequent flyer miles. United considers Nepal and South Korea to be in two separate regions, so it cost us 37,500 miles per person, plus $21.90 per person in fees. We got these United miles by transferring points from our Chase Ultimate Rewards account which we got by signing up for the Chase Sapphire Preferred Card. We also had some United miles gained from signing up for the United MileagePlus Explorer Card. Once we decided to head home, we had the idea to see if we could switch our South Korea ticket to one heading back all the way to Denver. Amazingly, there was United award availability for the day we wanted to leave, Sunday May 3. We called United customer service and fed them the flight details, and they agreed to change our ticket. We did have to pay the difference in miles and fees, as the new flight to Denver cost 42,500 miles and $52.20 per person. The United rep kindly agreed to waive the change fee once we explained the circumstances, which we were definitely grateful for. Our trip back to Denver required three flights: Kathmandu to Bangkok on Thai Airways, Bangkok to Tokyo on Thai Airways, and Tokyo to Denver on United itself. Both layovers were fairly long, and two of the flights were as well, so it would require over 35 hours of travel time. 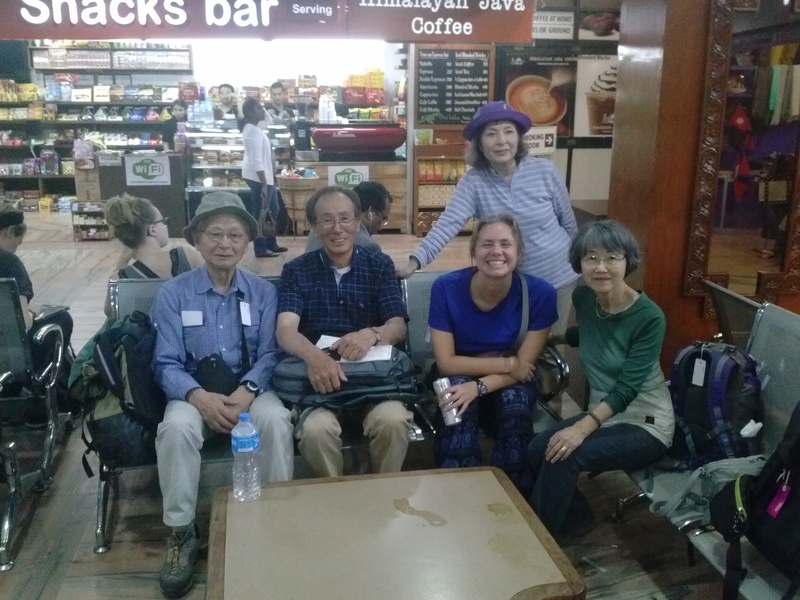 We got to the airport in Kathmandu four hours ahead of scheduled departure, since we had heard that it had been very crowded and chaotic since the earthquake. 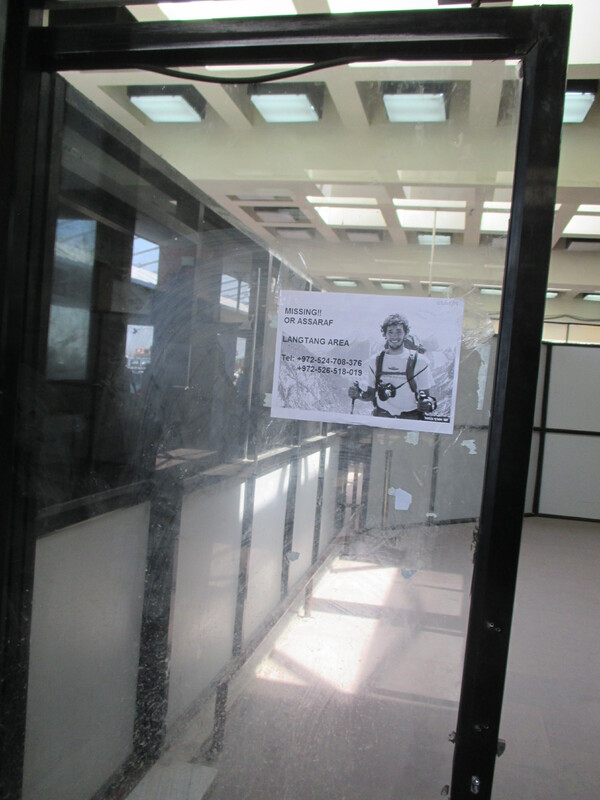 As we headed into the terminal, we saw missing people posters, including one for Or Assaf, who rode our bus to Syabrubesi. There was already a long line at the Thai Airways checkin desk, so we were happy we got there early. But that was the main delay; immigration and security lines were actually quite short. We spent a couple of hours in a small lounge where we got a bite to eat and bought some souvenirs with our last rupees. We also ran into the Japanese tour group which had sheltered with us at Bamboo. It turned out they were on our flights to Bangkok and Tokyo! 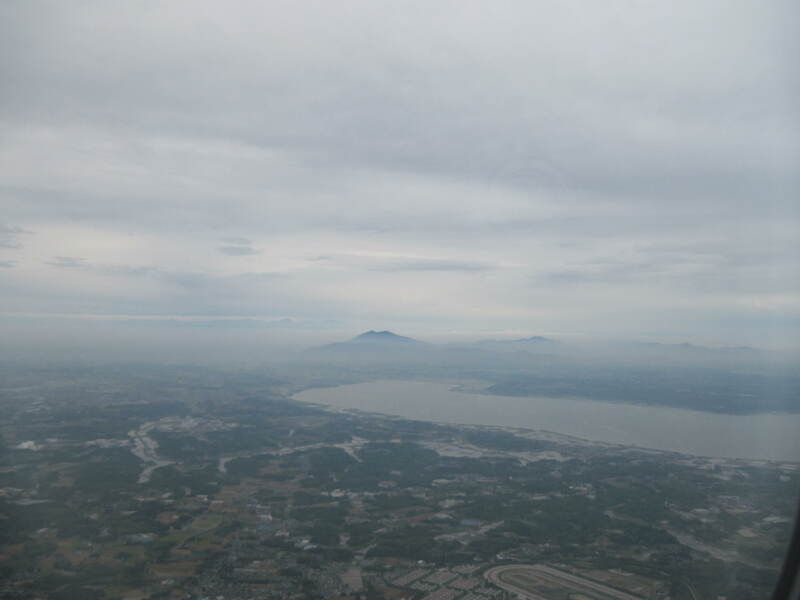 As we headed out to our plane on the tarmac, we got our last look at Kathmandu. We could tell the airport was still quite busy with relief supplies being ferried around. We had mixed emotions: happy to be going home to see family and friends, but sad to be leaving Nepal on such a low note. 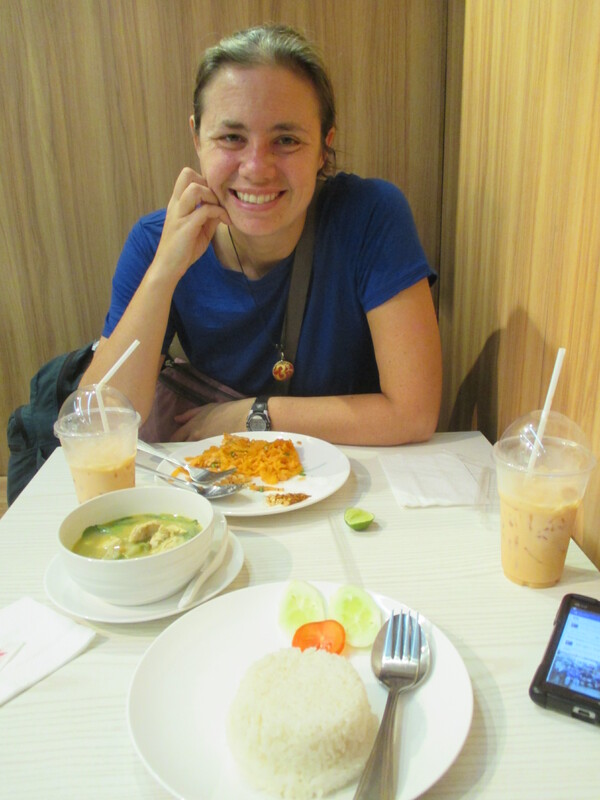 Once in Bangkok, we had four hours before our next flight. We were excited to be able to sample our favorite cuisine from the Asian portion of the trip again, so we sought out a restaurant that served Thai food. We found a small Thai Muslim place and enjoyed some of our favorites. 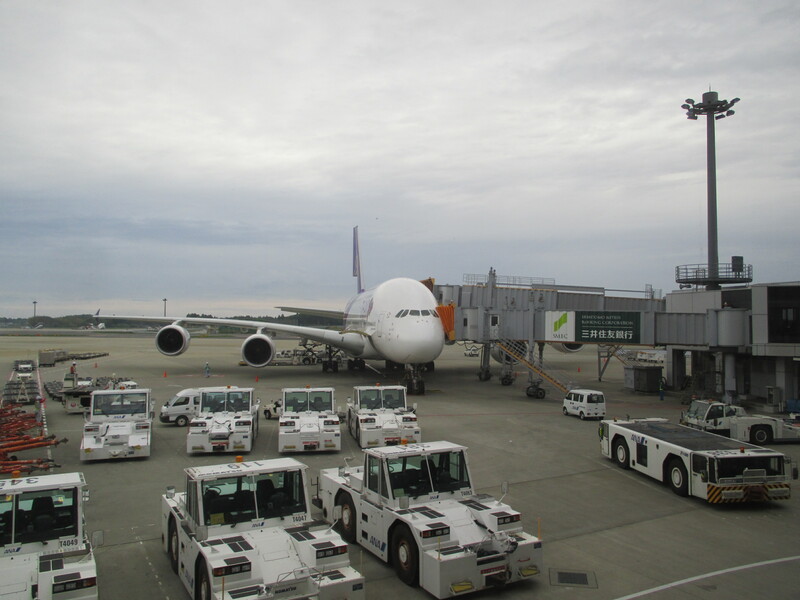 One part of the flight to Tokyo that we were looking forward to was the plane itself – it was our first time to ride on the giant Airbus A380. Our seats were towards the front of the bottom level of the double-decker plane, so we didn’t really get a feel for how big it was until we saw the outside after the flight. The flight itself was overnight, arriving in Tokyo at 6:30 AM, so we probably should have tried to sleep, but we mostly ended up watching movies on the fancy in-seat entertainment devices. Arriving into Tokyo was a little depressing, because Japan was to have been the final stop on our round-the-world trip. As we looked out onto Tokyo from the plane, we pondered what could have been. 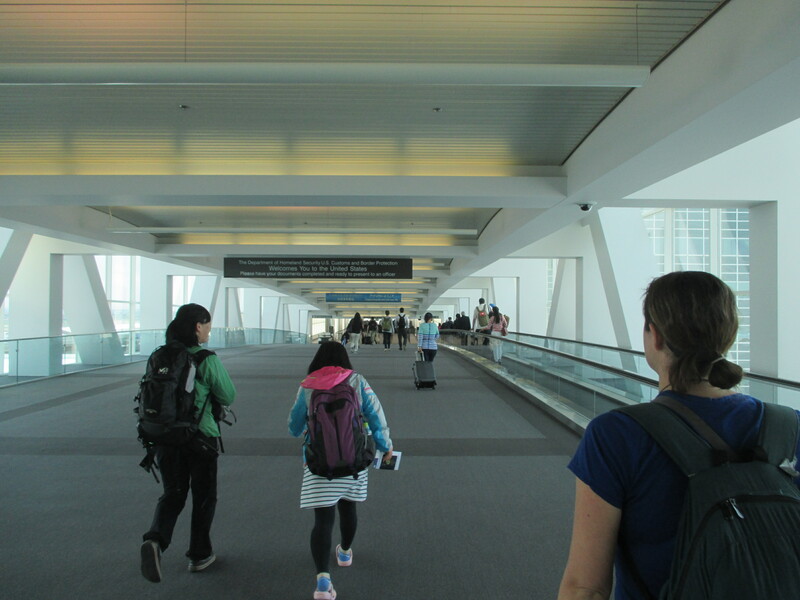 Our layover was ten hours, so we considered leaving the airport to get a taste of Japan, but ultimately we decided that we were too tired to really enjoy it. We would leave Japan for a full visit sometime in the future. Instead, we used two United Club passes (another perk of the United MileagePlus Explorer Card) to spend the day hanging out in the United Club. This was much more relaxing that just sitting in the outside area. We were even able to get a nice nap in. As the day went on, we took frequent advantage of the free snacks that were placed out, including sushi. We also had some free sake and draft beer poured by a pretty neat machine. The flight from Tokyo to Denver was thankfully direct, but long. It also went back in time, so to speak: since we crossed the dateline, we arrived in Denver (at 12:45 PM) earlier than we left Tokyo (at 5:00 PM). This flight was on another plane we were interested to fly on for the first time, the new Boeing 787 Dreamliner. The interior was quite nice and new, and we had another good personal in-flight entertainment screen to help us pass the time. We hoped for a nice, sunny day to welcome us back to Denver, but unfortunately it was cloudy and rainy. Nevertheless, it felt good to be home. As we said, we had planned on making our last stop on our trip in Japan. We had gone ahead and booked our return flight home from Tokyo as well. The booking on this was fairly complicated: we used American Airlines miles to book a series of flights from Tokyo to Denver, one on Japan Airlines and another on American Eagle. This was especially complicated because we couldn’t book it on the AA site, since it doesn’t actually show Japan Airlines availability. You can see it on the British Airways site though, so we got the flight numbers from there and had to call American and feed them the flight info. This cost us 32,500 AA miles and $44.90 per person. Once we came home though, we weren’t going to go back to Japan, so we wanted to cancel this flight and get back our miles. Cancelling was easy, but American charged a “reinstatement fee” of $175 to get the miles back. We tried to explain to the representative about our extenuating circumstances, but she couldn’t change the policy. So, we would like to again thank United Airlines for being considerate and waiving fees, since other airlines apparently can’t. We are wrapping up the story of our earthquake experience in Nepal. We were extremely fortunate to survive and to be able to come home to the USA. Our stories are now over, but those in Nepal are not that fortunate. Huge numbers of people have lost their homes and their livelihoods. Please take some time to donate (any amount, large or small, can help) to help this beautiful country recover. We’ve collected list of organizations that you might consider here. Thank you! Yes, we definitely appreciated their customer service. It was good to be able to get that ticket taken care of quickly and efficiently. We wouldn’t have had much energy for anything else! I can fully understand that. That’s why you need nice people in customer service that make clients happy, especially in severe situations! I am glad you got those special trats of flying the new airlines. I want to hear more sometime. glad it provided at least somewhat of a pleasnt final journey. What a great success story with using credit cards!